Vocal Tools Audition is a unique, affordable way to discover and experiment with the four-part (S A T B) Vocal Tools classical voice series. Each select patch is enhanced with Bela D Media’s original Vocal Tools script and is fully compatible with Native Instruments Kontakt 4/5 – full retail versions. There is zero reduction of sample quality and play-ability. The user is granted a single and individual vocal movement (playable phrase) per soloist. All vocal movements are in the natural legato state with the ability to advance along, miss-match and shuffle – in any key – within the given vocal range of the soloist. Vocal Tools Audition is 24-bit audio, recorded via the CAD Trion 8000 tube microphone direct into Pro Tools. 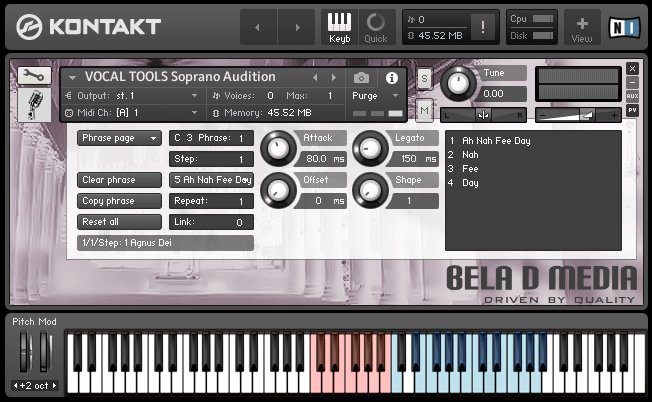 Do you wish to upgrade to Vocal Tools Quartet? Awesome! Even better news – 100% of your audition investment will be applied toward to the cost of upgrade. With each audition purchase, $9.99 will be subtracted from $99.99. To receive a corresponding savings coupon, you must first contact Bela D Media prior to upgrading. The audition investment credit and the ability to apply a credit toward an upgrade is only available through Bela D Media. Investment credits are not offered with authorized vendors. Vocal Tools individual and complete libraries are currently available via authorized vendors. A unique, affordable way to discover Vocal Tools! 1 vocal movement (playable phrase) per soloist. Audio demos composed with complete Vocal Tools libraries. Click to open each Vocal Tools Audition shopping cart.